There are so many internet content filters out there that it is hard to decide which one to use. These programs all have two (2) things in common. They are all software based, and they cost money. Well, there is an alternative that is free. You are probably wondering, what is DNS? If you have a computer, and are on high speed internet (ADSL or Cable), then you’re most likely familiar with the term IP Address. Every computer, regardless of where it is in the world (as long as it has a connection to a network, beit the internet or a Local Area Network) has an IP Address. The role of an IP Address is to allow communication between that computer and other devices. DNS provides the ability to assign an alias (if you will) to a certain IP address. For example, the IP Address for www.intel.com is 192.198.164.158. It would really be a pain if every site we wanted to visit required us to enter the IP Address of that site into the browser. This is where DNS comes in. DNS stands for Domain Name System. It resolves the names we type into an internet browser (such as Internet Explorer or Firefox) into IP Addresses. So when we type http://www.intel.com in the address bar of firefox, the DNS Server resolves that domain name to the IP Addresss 192.198.164.158, and sends us there. Getting back to OpenDNS. 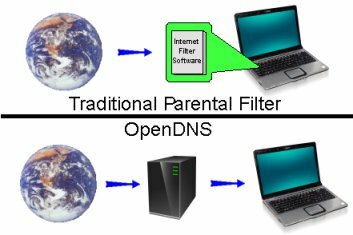 OpenDNS is an internet filter that resides on the internet before it gets to your computer. With traditonal parental filters, the software resides on the clients machine(s) and filters the content locally. This takes up precious system resources that could be used for other applicatons. With OpenDNS, the filtering is done in cyberspace before it gets to your network. This way, you don’t need to buy multiple licenses of parental software for all your computers. All that is required is one free account with OpenDNS, some changes made to the address of the DNS Server, and voila, you are protected. For more information, please go to OpenDNS. 2011 was a banner year for many, including cybercriminals. 2011 saw an Identity Fraud increase of 13% over 2010, bringing the victim count to 11.6 million for that year. Although the victim count climbed, the dollar amount remained steady. According the Javelin Strategy and Research, the dollar amount stolen remained steady, but the out-of-pocket expenses for remediation decreased by 44% (since 2004). This is likely due to improved prevention and detection tools being in place, and more efficient fraud detection algorithms being used. The study found four (4) overall fraud trends. Javelin looked at the socail media and mobile phone behaviors and indentified a higher incidences of fraud with respect to LinkedIn, Google+, Twitter, and Facebook. Although it fair to say that there was no proof of direct causation between the increase of fraud and these sites in particular. It was also found that despite warnings that social networks are a great resource for fraudsters, consumers still share significant amount of personal information on these sites. It was found that 7% of smartphone users were victims of identity fraud, which is 33% higher than the general public. Part of this increase may be attributable to consumer behaviors. 32% of smartphone users do not update their operating system when updates are made available. One likely factor to the fraud increase was the 67% increase in the number of americans inpacted by the data breaches in 2010. Javelin research found that consumers were 9.5 times more likely to be a victim of fraud over those individuals who did not receive a “data breach” letter. Javelin also found that 15% of americans (about 36 million people) were notified of a data breach in 2011. Countering this rise is the successful effort to combat identity theft coupled with greater awareness of the issue. Trojans have been around a while and for the most part, removal has been pretty straight forward. That is until now! A new dropper Trojan was recently detected by BitDefender Researchers. It uses a new technique in order to hide from AntiVirus software. Unlike other trojans that simply add themselves to the startup list, this particular infection utilizes the windows library file comres.dll (commonly used by browsers. communication and networking applications). The trojan copies, then renames the original file, alters the copied file and positions it in place of the original. Thereby, whenever the file is called by Windows, the trojan come to life. This backdoor trojan dropper allows cybercriminals to add/delete users, change passwords, add/remove privileges, and run executables with elevated privileges. Takeaway: Make sure that both Windows and your AntiVirus software are completed patched.